'Forker House', originally the Henri Bendel estate (later owned by W.P. 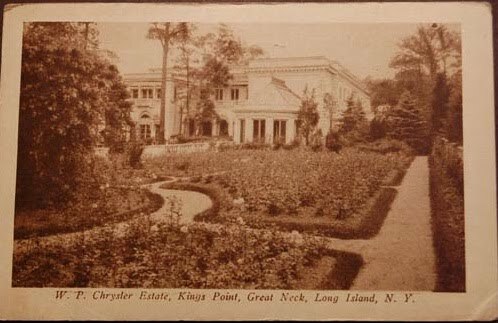 Chrysler) designed by Henry Otis Chapman c. 1916 in Kings Point. Click HERE to see the brochure from when 'Forker House' was for sale. thanks so much for the brochure. Bendel had a large Estey pipe organ installed and later Chrysler had the organ enlarged, then had Estey remove the organ and an AEolian pipe organ was installed. Nice to see the interior of the house when it was furnished. got to love those palazzos. i esp like the two story marble entrance halls and the "let's roast an ox" fireplaces. this hoiuse must have had a buyer just for grandiose mantlepieces - they are spectacular esp the living and dining and that mottled one in the rococo bedroom. as i've said before, if you're going to spend money - spend a LOT of money.